It has been said that Hollywood knows a genre reaches the end of its line when Mel Brooks can make a parady out of it. Witness Blazing Saddles marking the end of the Western genre, and Airplane marking the end of Airport genre. Well Ok, Airplane was not a Brooks film. My point stands. I suppose that that analogous situation for a politician is that he knows he had reached the end of his line when Tucker Carlson can skewer him. Imagine that you’re John McCain. You’re running for president for the second time, and this time you’re widely considered the frontrunner for the Republican nomination. Knowing that, you’ve got to expect that whomever is directing the television coverage of tonight’s speech is going to point the camera your way. You’re going to be on primetime TV, no doubt. With that in mind, you’re going to want to stay awake. If you’re McCain, who will be over 70 by 2008, you’ll want to make doubly sure to demonstrate your alertness and vigor. You definitely won’t want to slump in your seat, out cold, when Bush starts talking about Iraq. 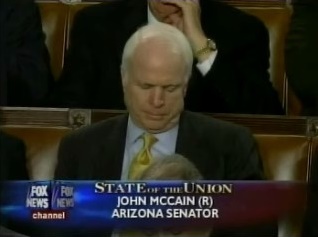 And yet that’s exactly what McCain did tonight, napping on camera for ten agonizing seconds. Lack of self-control? An expression of contempt? Embarrassing in any case. There are certain minimum requrements to be President of the United States, and one is to be able to stay awake through the State of the Union speech. Update: Added photo. H/T: Polipundit; NRO,.